A rendering of the new Armani store facade at 760 Madison Avenue. Armani and SL Green, New York’s largest commercial property owner, announced plans to redevelop the Giorgio Armani boutique at 760 Madison Avenue in New York City. The fully reimagined 97,000-square-foot building will be home to a new flagship Giorgio Armani retail boutique and 19 luxury residences designed by Giorgio Armani. Giorgio Armani will conceive the residential interiors and the designer intends to take up residence within the building upon its completion. Renowned New York architecture firm COOKFOX will serve as architect on the project and redesign the new building to reflect the evolution of the Armani brand which has become a perfect complement to the Upper East Side. The same philosophy and love for the essential, a hallmark of Armani’s style, are found in the interior design that translates the ideas of comfort and functionality into elegance. This sensitivity, teamed with awareness of the cultural factor, is what enhances the close ties this project will have with its surroundings. Iconographic elements of places and cultures, the appeal of new materials and unusual chromatic ranges have become the key style inspirations for individual interior design projects since 2004, when Giorgio Armani signed a partnership for the first Armani Hotel inside the Burj Khalifa in Dubai. This initiative was then repeated in other cities, from Miami to Istanbul, from Mumbai to Manila, from Tel Aviv to Beijing and London and now New York. 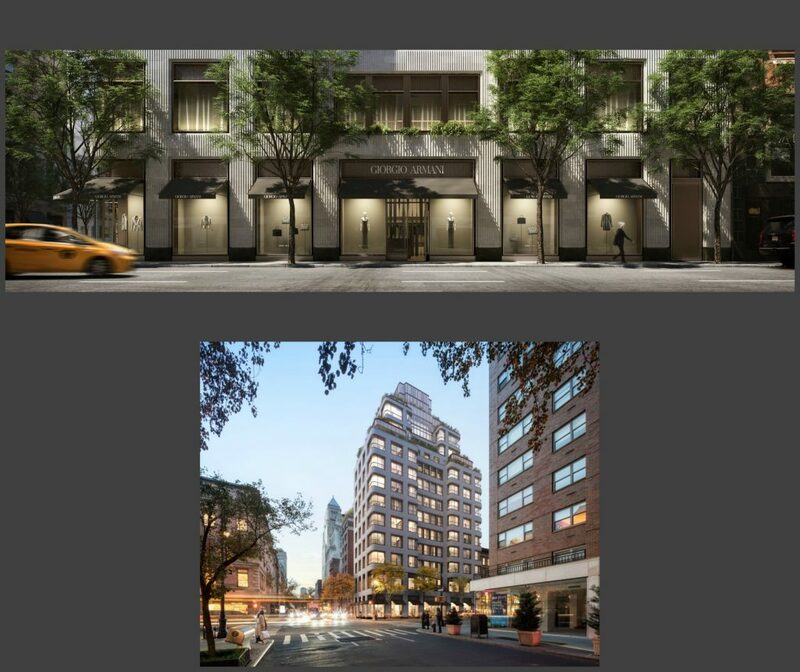 The team also includes New York’s premier historic preservation consultants, Higgins, Quasebarth and Partners, and zoning consultants, Greenberg Traurig, LLP, to help ensure that each aspect of the building design will be appropriate for the Upper East Side Historic District. The plan will require approval of the Landmark Preservation Commission. Construction is expected to begin in 2020 and be complete in 2023. Synonymous with lifestyle and elegance, the Armani/Casa line is linked to the Giorgio Armani luxury universe and, through its Interior Design Studio, provides a service fully tailored towards private individuals and property developers, from the conceptual phase to the supervision of the project execution.